China's markets re-open on Wednesday (initially we mistakenly said Tuesday) as the Lunar New Year celebration ends. Hong Kong markets re-opened on Monday, and Chinese shares that trade there fell. The Hang Seng China Enterprise Index (H-shares) fell 0.2%. Local reports suggested profit-taking after the run-up before the holiday amid light volume was the main driver, though the drop in oil weighed on Chinese energy companies that trade in Hong Kong. There is some rumblings in the media, which remains fascinated by the "currency war" meme, and among some analysts that see "currency wars" everywhere, that China may seek a weaker currency as it wrestles with its economic slowdown. 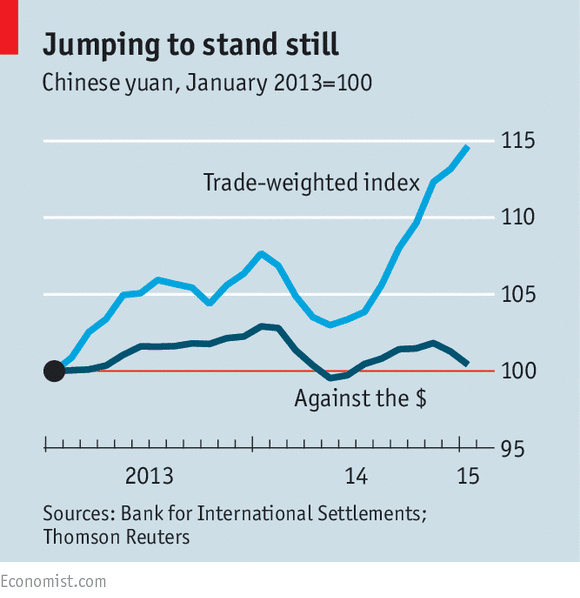 This Great Graphic from the Economist shows the broad trade-weighted measure of the yuan has appreciated by 15%. It is at a record high. The chart shows the yuan is flat against the dollar over the past two years. Most recently the yuan has weakened against the US dollar. China's central bank surprised the market with a 25 bp cut in the one-year deposit rate and a 40 bp cut in the lending rate last November. Since then, the yuan as declined by about 2.1%. Given everything else that has happened, the yuan has fared better than most currencies, and this is what is reflected in trade-weighted index. Even with its recent modest yuan losses, US officials seem unperturbed. In fact, just last week US Treasury Undersecretary for International Affairs, Nathan Sheets observed that China has stopped intervening in the foreign exchange market. Sheets may be overstating the case. Previously the PBOC appeared to have been slowing the rise of the yuan. Now it appears to be leaning against depreciation. The slowing of the Chinese economy, the anticipation of easier PBOC policy, while the Fed prepares to raise rates, appear to have spurred capital outflows from China. Reserve accumulation has gone into reverse. China's reserves peaked just below $4 trillion (~$3.993 trillion) at the end of Q2 14. As of the end of the year they stood at $3.843 trillion. This decline likely reflects mostly valuation adjustments. In the H2 14, the euro, which is believed to be the second largest currency in China's reserves, lost 11.6% of its value. Assuming its had a quarter of its reserves in euros, which is likely a very conservative estimate, this would alone would account for around a $110 bln decline in China's reserves, which fell by $150 bln. Sterling and the yen combined may account for about 7% of China's reserves. Those currencies lost 9% and 15.5% against the dollar respectively. That would account for another $25-$30 bln of the change in reserves. On the other hand, the reserves are not just kept in spot currencies, but rather they are investment in mostly fixed income instruments. Bonds in the US and Europe rallied in H2 14, and this too needs to be factored into the evaluation. However, on balance this suggests that China's reserves did not fall as much as they may have appeared. At the same time, in H2 14, China recorded a trade surplus of about $280 bln. However, the current account surplus is less than half of this. This back-of-the-envelope calculation suggests that the real capital outflows were modest (PRC estimates it at around $90 bln). There are three risks associated with a policy seeking to depreciate the yuan. First, it may encourage other countries in Asia to do the same, which would erode the potential advantage. Second, it may spur destabilizing capital outflows. Third, as the BIS noted, Chinese businesses have taken on around $1 trillion of foreign currency (mostly dollar) debt. A sharp depreciation of the yuan would expose the currency mismatch challenge. In addition to the risks, the benefits of a weaker currency may also not be what they seem. Chinese exports are more a function of foreign demand. It varies from product-to-product, but in sectors that Chinese workers are assemblers, there is limited yuan-incurred costs, which makes exports less sensitive to the yuan's exchange rate. In addition, a decline in the yuan may not boost CPI, which in January was 0.8% on a year-over-year basis. Chinese officials say that they use a basket of currencies, not just the dollar as reference for the yuan. We suspect this will continue to be the case. When evaluating the yuan, it may be important to look at it against the dollar, but also, increasingly, on a trade-weighted basis to appreciate the economic impact of currency developments.